If I had to live with only one pair of shoes for fall and winter, it would be bean boots!! These shoes are good through snow or rain, and keep your feet warm in the coldest temperatures when layered with camp socks. If you get any mud or dirt on these shoes, it simply wipes right off. I have worn these through mud puddles, creeks, you name it, and they still look awesome. As I said clean-up takes under five minutes. These shoes are made to last a lifetime and L. L. Bean has a lifetime warranty, so these shoes really will last forever. L L. Bean makes two popular lengths: the six inch and eight inch. If you're 5'4 or shorter, I would get the six inch, and eight inch if you're taller than 5'4. Personally, I find the six inch to be comfier than the eight inch because of where they hit the leg. The only other reason to consider the eight inch is if you live in a really snowy climate (two inches can really make a difference) in which case you may also want to consider getting thinsulate or gortex lined bean boots. If you get a ton of snow, Bean also makes a ten inch length. L. L. Bean's two most popular colors of bean boots are the brown and navy. Normally, I would go for navy, as it's my favorite color, but do not! I almost got navy and am so glad that I got the brown because they match so much more. Get the brown. If you want to get the navy don't let me stop to you, this is just my opinion and recommendation from my experiences. Sizing on bean boots can be very tricky. 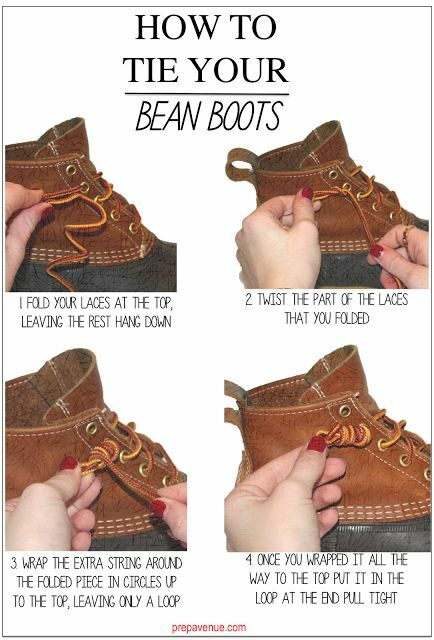 If you're familiar with bean boots, then you know L. L. Bean only makes whole sizes. If you are going to be wearing bean boots with thicker socks (i.e. camp socks), then order your normal size; order a size down if you're a half size. I am a 7.5, so I wear a 7 in bean boots. The Bean site recommends ordering a whole size down (even if you wear a whole size) if you plan on wearing bean boots with thinner socks (i.e. J. Crew trouser socks). However, I do not recommend this, as these shoes are best with thick socks! I recommend that you order your normal size and a size down if you're a half size. Also, if you are smaller than a 6, L. L. Bean does make kids sizes in bean boots! As soon as you order your bean boots, buy camp socks! I am a fan of J. Crew and L. L. Bean's camp socks. These are a thick, marled knitted sock that keep your bean boots extra warm. Not only do they complete the look, but they also prohibit blisters. I have heard some women wear size 9+, and the camp socks are too small. If you have have this problem, know that L. L. Bean makes their camp socks in sizes and try mens camp socks (there's no difference except they're bigger). Bean boots are almost always on backorder. What did you expect? L. L. Bean makes these shoes by hand at their factories in Maine. The company refuses to go overseas and mass produce because they want to stick to their roots and keep up the good quality. L. L. Bean is making as many pairs of boots now as they ever have, so the demand for bean boots will cause backorder. If you're contemplating, bean boots are absolutely and 100% worth the wait for the real thing. Do not go to a boutique and buy $30 knock-offs as the quality is not there and they will not make it through the snow. If you absolutely can not wait, Sperry makes a saltwater boot, which is the next best thing. These are available on Country Club Prep (email me for a 20% code at xcgal98@gmail.com). As these are also selling out, check out the Sporto duck boots. I made a whole YouTube video styling bean boots and there are other blog posts styling bean boots linked in that video along with the outfit details from these photos. Do you have bean boots? How do you style them?